We now have a discord channel! Need a server to play with friends? Don't know how to setup one? Just rent already configured server! Not enough for you? Want more? Explore new dimensions - Twilight Forest, The Betweenlands, Aether, The Beneath, Cavern II! Find new mobs, experience new landscapes and unravel more mysteries. Step through dimensional doors to find mazes, dungeons and traps. Lose yourself in enchanted forest where time stopped at twilight and encounter boss monster like Lich, Hydra, Naga and few more. Make your way to the wonderful world of Aether... Explore an amazing realm in the sky with help of your newly crafted airship! Delve into labyrinths, aquire new equipment and fight even more bosses. Still reading and not dowloading the modpack? Got more for you - Betweenlands. It's a harsh unforgiving world of swamps and dangers with many new mobs and bosses with lots of new mechanics, blocks and items for you to explore. Experience all the beauty of new worlds. 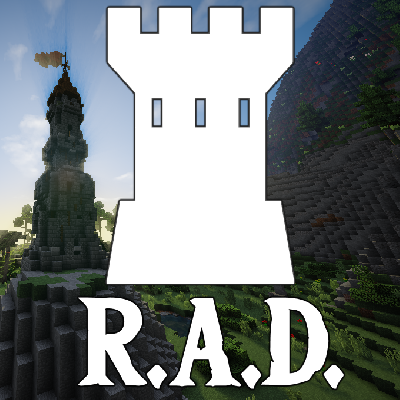 tons of dungeons and new structures to find and explore. Delve underground or explore ruins on surface. be a wizard! RPG-style system of magic spells to Minecraft with the aim of being as playable as possible. No crazy constructs, no perk trees, no complex recipes - simply find spell books, cast spells, and master the arcane! increased mobs variety: from peaceful chameleons to creepy creature. quests that will guide you through the game and give you some challenges. earn coins for completing quests and exchange them for valuable rewards you like. scaling difficulty. As you become stronger mobs will too! airships! Perfect for your Aether exploration. random modifiers for you weapon and tools. level up your skills and your equipment. simple and more advanced enderchest-like backpacks with own inventory for long journeys. some improvements to wolves. Make a new friend so you don't travel alone. ...and more for you to discover! I would also recommend to pre-generate the world(built-in feature on world creation) to reduce lags while exploring. F7 - Key wizard. Shows a visual representation of a standard QWERTY keyboard, allowing you to easily find keys that are unbound or conflicting. F8 - Light level overlay. F9 - Toggle chunk borders. C - Accessory equipment menu. 1. I got an error "Error: The specified path, file name, or both are too long. The fully qualified file name must be less than 260 characters, and the directory name must be less than 248 characters." The only way I can fix this is by renaming the modpack which I prefer not to do. The only workaround you can do is to create your own profile in twitch launcher, download .zip file from Files directory and import it. OR try to change minecraft modpack installation folder in Twitch launcher's settings. 2. My game crashed. Help! I can do nothing without crash-log and\or logs. Please open new issue and provide them. 3. I spawned in ocean several times. Help? This is not my fault and i can't do anything about it. 4. Where's my FPS? I have top end computer which can run Witcher 3 on ultra and 32 gb RAM allocated to minecraft. Help! I run every pack with 4gb RAM allocated to Java and 8gb total and I don't see any issues. I'm testing this pack flying around with every update - it spikes only on worldgen, so either pregen world or remove some worldgen heavy mods like RecurrentComplex. 5. Is this pack dead? No updates in ages! Please answer to my comment senpai! No, it's not dead. I'm updating it when I decide and have free time. Please understand that I'm a human being like you. I have a job(three, to be clear) and don't have much free time so making modpacks is like hobby for me and I do it when I have more free time than usually. Although I'm trying to check curseforge everyday and reply to you. This modpack was built ontop of my base vanilla forge modpack and it's suits very well. Check it out for better vanilla experience. PS. I'm making this pack for you to play. Please consider leaving some sort of feedback, any issues or suggestions what mod you want to see in this pack. Hello, I have a problem regarding the server, I can set it up fine and everything. But there is something wrong with TPS. I have tried to change it for different numbers, even disabled it, but it doesn't seem to solve the problem, I don't know which might be the best option. I'm clueless by now. There is even nogui there arleady. I would really appreciate if someone could help me find a solution for this problem. For those in the NZ/AUS region. I have a server setup but you will also need to install Psi 1.1-68 as well. Just download that and put it into the mods folder. Multiple errors and warnings when running server pack 1.21 that were not there in the last pack. Please redownload the latest serverpack. I downgraded Silentlib to stable version there. As for other warning I cannot do anything because this is mods author's responsibilities. Why does the server launch stops at unloading dimensional world 7? Because it's completed loading and working now. Oh okay, thanks, i tought that it stuck there. Silent Lib: Requires version 3.0.10 but client has 3.0.9. That would be Scaling Health. The default is set to Weighted Average, meaning your difficulty is based on an average of your own difficulty, and the difficulty of everyone around you, with closer players having a stronger effect on the average. The difficulty goes up over time, as well as from killing mobs. Where [player] is your name, or anyone else's name in the server. "Increase Per Second"=0.0011574074 - This is how much the difficulty increases every second of game time. The lower the number, the slower the increase in difficulty. "Max Value" = 250 - This is the highest difficulty level. "Reset Time"=None - This is how often the difficulty level is reset. You can have it reset every day (DAILY), every week on a specific day of the week (SUNDAY, MONDAY, etc. ), or at the first of every month (MONTHLY). After falling in a Dimensional Door Dungeon instead of falling in limbo I died and respawned in a white sky islands dimension. Is that normal? I want to get a shaders pack or resource packs whatever (because shaders/resource packs make it look realistic and neat) but want one that won't bug or whatever. Any suggestions on which pack to use??? or was this a dumb question and i just shouldn't get one?? Well... I've used "KUDA Legacy" with Optifine Ultra E3 and the only issue i've found is: You Can't change shaderpacks in-game, but you can in title screen. Is there a way to pick up mob spawners? I know Chest Transporters can do it but the function to pick up spawners is disabled so is there other ways to pick up spawners? make a pick with Unique Crops and upgrade it to level 10. It's what I did and works like a charm for grabbing spawners. Where can I get the server files to play this with my friends? In the download section. Scroll down a bit. I'm at a loss here.. I have 3 other servers (1.64 Moonquest, 1.7.10 JTTC, 1.7.10 Regrowth.) All of them (with a bit of fiddling) are working 100% with Resourcepacks AND shaders. I'm trying to get a 1.12 (Roguelike Adventures and Dungeons) server working because it looks really neat. After most of my afternoon.. I have the server up and stable, We can all connect to it.. and switch resourcepacks.., you can open the shaders option, but the second you click on a shader (Including the Internal Shader..) the game just freezes... must be killed to get out. I have tried All 11 versions of Optifine for 1.12.2 and like I said.. I am at a loss. I have tried all sorts of things, updating mods, removing mods and everything seems to be running flawlessly until you try to pick a shader..
Because I had to kill the process there is NO crash report.. I'm hoping someone can help. I am also having an issue with Dynamic Surroundings. I have to take it out of the modpack to get into the game. "java.lang.NoClassDefFoundError: Could not initialize class org.blockartistry.DynSurround.client.ClientRegistry"
The part thats causing issues ins "DynSurround.client.ClientRegistry"
The Dynamic Surroundings crash is due to the mod being outdated. Download the updated version and you should be able to join the server.